In September 2000, I decided to travel to the Middle East for the first time in my life. I always wanted to go there, but some other trips within Europe and Eastern Asia kept me away. There were many good reasons for travelling the Middle East - the desert, the history and last but not least to find out more about the ongoing conflict. I'd got two invitations from Israelis but I also wanted to see Egypt and Jordan, and so the travel route was quite strange. I started and finished the trip at Ben Gurion airport near Tel Aviv, and so I had to enter Israel three times. The trip was 'well-timed' - the day I left Israel to go back, another bloody unrest started (leaving my parents asking "what have you done again!?"). And it's not getting better. More about this at the end of this travelogue. Please note that this travelogue is from the year 2000. Things change quickly, especially in the Middle East, and this includes prices and exchange rates. Please click the following link to see the travel route (20 KB): Map of the Middle East. Modern Hebrew (Ivrith), (Palestinian) Arabic. Many people speak English, but Russian is quite common, too. most nationalities can stay 3 months without a visa. Procedures at the border can be fierce. Land, Air, Sea. There's an exit fee at the border to Egypt at Rafah of USD 35. Exit fee at the checkpoint Eilat / Wadi Araba to Jordan is 64 NIS. There's no exit fee and airport tax at Ben Gurion Airport. there's only one train connection, so busses are the best option. I arrived around 3 am at Ben Gurion airport near Tel Aviv. My luggage didn't. But KLM was quite generous, paid 500 Shekel (some € 85) and handed out a toilet bag full of goodies. That's what I call a good deal. Bus No 222 (the first bus runs 4 a.m., the fare is 16 NIS) brought me to the centre of Tel Aviv. There, I headed for one of the budget places called Gordon Hostel.. A night in the dorm set me back 35 NIS (students pay 32). 1970ies style, loud music and many people with just one mission: To be cool. Well, some of them were a bit too cool, but still it's a fun place. It's quite central and you can see the Sea from the balcony. There's even a kitchen. Check-in started at 10 a.m., and so I decided to go for a walk first. Tel Aviv is a young, pretty expensive, vibrant but not very exciting place. In the evening I managed to meet a former pen-pal. She took me to Holon, one of the suburbs. She offered me to stay with her family, and it was a great experience - thank you, Hemdat! Time to get my luggage, and so we went to Tel Aviv to pick it up at a hotel. It really arrived on the next plane. What a pity - one more day without my luggage = 500 Shekel would have been nice. After that we went for an extensive walk through Tel Aviv and Jaffa. Jaffa had been swallowed by modern Tel Aviv many years ago and features a nice historic core. There are plenty of mosques, synagogues and churches all over the city. Additionally there's a small fishing port, a nice park and a bazaar. Day 3: Shabbat. For Christians it's Sunday, for Jews it's Shabbat. Shabbat starts on Friday at dusk and lasts until one can see the first three stars (!) on Saturday evening. The rules are very strict - it's forbidden to use fire and therefore it's also forbidden to use any kind of electrical devices. There's almost no public transport and almost no cars on the street. You can read but you shall not write. You shouldn't carry anything with you. Telephones are taboo (I like that!). Almost all shops are closed. Let's face it - it's a hard time for travellers. I found out that there seem to be three types of Jews religion-wise. Some are non-practising, so to say nonreligious Jews, some are conservative and some are ultra-orthodox. My friend's mother was more or less nonreligious and therefore didn't really care about Shabbat. My friend was conservative and therefore kept the rules. However, I was the one to put on the oven - the mother said 'Goi i Shabbat' (or something like this, meaning - I'm not Jewish (=Goi), so what shall I care about Shabbat) and smiled. It looks like there aren't so many ultra-orthodox Jews in Tel Aviv, most of them seem to live in Jerusalem and elsewhere. All we could do on Shabbat was another walk through Jaffa, but the town was well worth it. Day 4: I didn't want to bother my friend any longer and therefore returned to Tel Aviv. There, I picked up my visa at the Egyptian embassy and took a bus to the Diaspora museum, which is outside the town. Entrance fee was 20 NIS, and the museum was very interesting. At night I relaxed in the rooftop bar of Gordon Hostel. I felt like an outsider with a beer in my hand - everyone was smoking weed. Even at night it was quite warm outside, and so I decided to sleep in my sleeping bag on the roof of the hotel. 997,739 km². Half as big as Mexico. Parts of the SE are under Sudanese control. Arabian. There's a distinctive Egypt dialect. Many Egyptians speak English or German. Land, Sea, Air. There are many direct flights. Exit fee to Israel at Taba is E£ 2. Attention! There are many checkpoints on Sinai peninsula. Many of them ask for bakshish. Buses and shared taxis are the best bet. The bus to Cairo left 8:45 in the morning. The ticket cost USD 40, plus USD 35 exit fee. Quite an expensive pleasure! Although it was a regular, quite big coach, there were only 9 passengers aboard. Among them there wasn't even a single backpacker. I've noticed that before - the cool folks of Gordon's felt somewhat estranged by the idea of moving to Cairo overland. But where's the problem? The bus ran all along the coastline. I hoped that we would cross the Gaza Strip so that I could get a glimpse at how life is there. Unfortunately we left the coast and continued along the border to Gaza. At the Egyptian border we entered the no man's land, where we moved northwards for a few kilometers. Leaving Israel and entering Egypt was no problem at all, and so we crossed northern Sinai peninsula and took a ferry across the Suez canal. Eventually we arrived in the centre of Cairo. A gentle Egyptian (what is it that he wants!?) showed me a hotel which is not mentioned in the guidebooks. I was a bit sceptical, but the hotel turned out to be a great place. A huge room with a nice balcony (with a view on bustling Talaat Harb st) inside an old building. The staff was extremely kind and helpful. The name: Hotel Gresham, facing Talaat Harb St right in the middle of Cairo. A large room (with three beds) was E£ 25 a night incl. breakfast. Since it's not mentioned in guidebooks, it was pretty quiet and there were only very few backpackers. Lesson 1: Do not follow a perfume dealer or other hawkers. Some of them are extremely annoying. They know many languages, but they don't understand the word 'NO'. It takes ages to get rid of them and you almost have to turn nasty to leave the shop / the person without buying something. Anyway - the perfume stinks! Lesson 2: If an Egyptian asks you to go with him to a duty free shop to get some booze, you can do that. However it's not true that only duty free shops sell alcohol. It's only about the fact that duty free shops are cheaper. By doing this favour, all you do is to support the local alcohol gourmet fraction! This day was completely dedicated to the Egyptian museum. Admission fee is E£ 20 (students 10), but the interesting mummy exhibition costs an extra E£ 40 (reduced 20). Bring your ISIC-card if possible, since only the visit of the museum itself is worth the cost of the card. The museum looks rather normal from outside but houses more than 100,000 objects from ancient times. You'll at least need a full day to have a glimpse at everything. However, most explanations are rather poor - mostly in Arabian and sometimes in French only. In summer it gets real hot inside. To make things worse, dozens of busloads of tourists roam about the museum, blocking the view of all famous relics within a 30 second rhythm. Nevertheless seeing the famous mask of Tutankhamun and other relics is definitely worth the money and the struggle with tour groups. The day before I'd met an Egyptian student. He was very nice and offered me to go for a walk through Islamic Cairo (actually it's a strange name - almost all of Cairo is Islamic). This area is a very old and vibrant part of the town, featuring large bazaars. Mohammed talked a lot about the country and strongly recommended to visit the oases in the west. That was my intention, but after some thinking and calculating I found out that I wouldn't have enough time for this. A reason to come back to Egypt... After strolling around Islamic Cairo we went to te citadel and the two huge mosques next to the citadel. They really look great at night. At the end of the day, we returned to a coffeehouse to sip a tea, smoke a nargila (water pipe) and enjoy a nice chat. Day 7: To the pyramids! When in Cairo, then it's somewhat of a must-see. The public bus from the centre only cost 25 Piaster. There's a lot of scam around the pyramids, and so one must be really careful. I hate annoying people (well, who doesn't), and so it was quite a drawback. One fat, small pathetic Egyptian dared to sell bottled water for "E£ 100 only!!". One Japanese tourist seemed to be clever. I guess the hawker wanted to know the Japanese word for 'cheap', but the tourist told him the word for 'expensive'. What a great sight - a hawker, shouting 'It's very expensive here' in Japanese all the time. Admission fee for the pyramids is E£ 20 (reduced 15). This doesn't include the entrance fee for the pyramids! Entering the pyramids is not everyone's cup of tea - the corridor is extremely narrow and steep, so it's almost like crawling inside. Go inside when you think it's hot outside - inside, it's even hotter, so it's quite refreshing to be out in the sun again! Although Mamluks had amputated its nose, the Sphinx still offers a stunning sight. This place is indeed worth to be called one of the Seven World Wonders! Back in Cairo again - what a heat! I went for the citadel and the two mosques again to see them during the day. The mosques stand next to each other and look like a dark castle - quite an impressive place. No, this is not Mr. Jackson! Time to leave noisy, smoggy and unbearably hot Cairo! It's a nice place indeed, but it's also nice to leave it behind. Somehow I managed to get to Sinai bus terminal on a public bus. This bus terminal is quite out of town. Soon I could find a bus running to St. Katherine's monastery on the Sinai peninsula. The bus wasn't even booked out, and so I got a ticket for E£ 35. The air-conditioned bus left on time and was full of Egyptians (how come?). Soon we arrived Suez city. At the bus terminal, which is also used as a bazaar, we had time to grab some lunch. We continued along the Suez canal. Driving along the canal offers a great vista - it looks like all the huge ocean liners, following each other in a distance of around 1 km, would plough their way straight through the desert. A long tunnel leads to the Eastern part of Egypt, where we headed southwards along the Red Sea coast. Somewhere the bus left the coastline and entered Sinai. All the way from Cairo, Egyptian movies were shown. 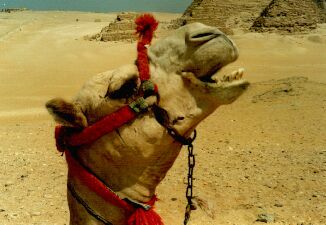 I guess they must have been funny, since all Egyptians laughed a lot. The broken speaker above my head wasn't funny - the penetrating noise was braising my brains. The bus was pretty fast until we entered Sinai, but then we stopped at every corner to pick up or spit out passengers. And so it took much longer than I'd expected. At a crossroad, the driver told me that this would be the place I would have to get off. And so I did - together with two Japanese backpackers who didn't knew each other as well. Another passenger pointed at one direction and said something like "there, hotel!". It looked like we would have the same target, and so we introduced ourselves and started walking. It was already after sundown when we found out that the road leads to the monastery. It's possible to stay there, for "USD 30 only!" in a 3-bed room. That was too expensive, and so walked back and now it was already pitch-dark. There's a small village, where we could find the one and only cheap place to stay around. The place is called El Fayrouz and looks like a military base. It features 12-bed dorms (quite old-fashioned, with two platforms left and right, were people sleep next to each other) and costs E£ 15 only per person. We were the one and only guests, and so there was plenty of space. After a three hours sleep we got up at 2 a.m. We could even get coffee and tea before we took off. We headed for Gebel Musa aka Mt Sinai, the place where, according to the bible, Moses received the Ten Commandments. The timing was perfect - it was full moon, so we didn't even need the torch we didn't have. Countless tourists - where were they all coming from!? - had the same idea. After around one and a half hour we reached the summit. The mountain is 2,285 m high, the last part of the trail consists of steps. And so we were soaked with sweat, when we arrived. The heat soon gave way to a teeth-chattering contest - it was quite chilly atop the mountain. There's a small chapel and a kiosk (selling drinks and renting blankets) on the summit. At around half past four, a weak blue in the east began to challenge the marvellous starry sky. The blue got lighter and lighter, and the air colder and colder. It seemed to take ages until the blue gave way to a yellowish red colour. Now we had a first idea of where we are - atop a mountain, surrounded by a breathtaking, mountainous desert. Around half past six, a small part of the horizon was suddenly aflame. The haze opened like a curtain above the mountains in the east (Saudi Arabia!? ), and then the sun came out. It took only a few minutes until we could see the whole sun. The long shadows of the mountains nearby offered a stunning sight. There are a few mountains in the south that are higher than Mt. Sinai, but there's nothing higher in the north. A lofty place. We decided to take another route back. The second trail is called '3000 Steps of Repentance' and leads to the St. Katherina's monastery, which is still inhabited by monks. We were starving when we finally arrived the village. I was planning to go to Eilat in south Israel during the day, and I needed to hurry, since it was Friday and Shabbat would start in the evening. We picked our luggage at the hotel and headed for the bus station, where we could get our longed-for breakfast? lunch? There was a bus station, indeed, but no bus at all. And this wouldn't change throughout the day, as locals told me. The one and only chance to get to Nuweiba at the east coast of Sinai would be a shared taxi, but there was no one who would share the taxi. The first driver asked for E£ 100 to Nuweiba. What a cheek! I asked another driver and haggled a few minutes to beat down the fare to E£ 30. Halfway we passed many checkpoints. There are time-consuming and annoying. The driver even had to pay some bribes. Eventually we arrived in Nuweiba. Suddenly the driver asked for E£ 40 - "special price" because of the bribes. Unfortunately I hadn't got the right money but only two E£ 20 bills. That's what I call bad luck. After a 10 minutes long quarrel I got back E£ 7 of change. I didn't really feel like argueing much longer over the last E£ 3. There's only one bus a day from Nuweiba to Taba at the Israelian border. The bus leaves at noon - unfortunately I found out about this at quarter past noon. According to the staff of a hotel, the only chance would be to catch one of the few shared taxis passing by occasionally. The price would be at least E£ 20. And so I started walking along the dusty road in the heat of the day and tried to hitchhike. Suddenly someone shouted "Taba" out of a shared taxi. I stopped the car and asked for the price. There were already five Israeli in the car and so it was E£ 20 only. That's what I call good luck. The car even went straight to the border crossing. Actually I wanted to buy one or two souvenirs from Egypt, but there was nothing around the boder. And so I entered Israel again. Except for the fact that a customs lady and a trainee (a beautiful young woman) examined all my dirty laundry for half an hour, I had no problems to cross the border. In Eilat I opted for the Spring Hostel a bed in an air-conditioned (!) dorm costs 30 NIS. The hotel is quite big and very clean, and there's even a small pool on the roof, a bar downstairs and internet. I wasn't interested in all the gimmicks - all I was yearning for was a bed. No pictures of this day! See day 11 for the reason. Eilat offers an impressive nightlife. The town is very touristy and cheaper than Tel Aviv, but still quite expensive. It was Shabbat again, and so I had to stay two nights and a full day in Eilat. The town itself is not really interesting and so I spent the day walking around the town and swimming in the Red Sea. Personally spoken, the main attraction of Eilat is the airport. It was built before the town itself developed, and so it's right in the centre of town today. At night I went to a pub in the centre to write my diary. It wasn't the right place to do that - soon I met some interesting Israelis and Russians. No pictures of this day! See day 11 for the reason. 97,740 km². Slightly bigger than Indiana. Some 4.6 million. Among them some million Palestinian refugees. 'Ammân - around one quarter of the population lives in and around the capital. Arabic (there's a Palestinian-Jordan dialect). Some speak English. Almost everyone needs one. But you can get it at all border crossings easily. The fee is JD 10 and more. See also Picture of Jordan Visa. Land or Air. There's a JD 4 exit fee at the border to Israel. Attention! Visas cannot be obtained at Allenby-bridge between Jerusalem and Amman. There's no chance to get to Syria or Saudi Arabia when you have been to Israel before. The visa for Saudi-Arabia is difficult to get and should be arranged before coming to Jordan. There are buses to Iraq. However situtation in Iraq should be carefully checked beforehand. No railway network - buses and shared taxis are the only way to get around. Shabat is over and Jordan is waiting. I went to the bus station to see whether there would be a bus to the border. Negative. All I had was a rather bad map of Israel. According to that map, the border crossing is not far from the coast. And so I walked along the coast just to find myself inside a restricted area. Out of town, I wanted to take at least one picture of Eilat and the Red Sea. But - I was aghast when I found out that my camera had disappeared. Where!? Why!? Oh my devoted mate, serving me over so many trips! Inside the camera were 35 (!) marvellous pictures of Sinai peninsula. I wasn't sure what was worse - the loss of the camera or the loss of the picture. The next surprise wasn't a good one either: The border crossing is far away from the coast somewhere in the north. And so I walked back to the town in the heat of the day. There, I bought an extremely simple camera for NIS 80. I found a better map and saw that the border crossing is too far away to walk there. Eventually I had to take a taxi for NIS 12. I crossed the border on foot, which didn't take long since I was the only one. The border crossing is in the middle of nowhere. It's a few kilometers to Eilat and a few kilometers to Aqaba. The taxi fare for the trip to the centre of Aqaba is JD 4 - a fixed price by the way. A man at the bus terminal in Aqaba told me that there would be a bus to Petra in 10 minutes. Shall I stay in Aqaba? Or go ahead? I opted for the bus. It was a microbus, and so the fare was JD 5 (on a regular bus it's JD 3). After a one hour ride through a spectacular landscape I was the only passenger left. This shouldn't change all the way to Wadi Musa, and so I could sit next to the driver. Petra is the name for the ruins only - the small town next to Petra is called Wadi Musa. The driver asked for the name of the hotel. I decided on Mussa Spring Hotel, and so the driver went straight to the hotel. A place on the provisionally roofed top of the building (you'll need your own sleeping bag) costs JD 2 only. The owners of the hotel are very friendly. The hotel is atop a hill and it's getting cold at night. There are two mosques nearby, and so it's quite noisy in the early morning. In the afternoon I went out for a walk through the town. Wadi Musa itself is nothing special, but the setting is great. The transfer to the entrance of Petra at 7 am was free of charge for hotel guests. Admission fee for one day is an incredible JD 20 (! ), for two days JD 25, for 3 days 30 (than the 4th day is for free). I followed the small path which leads into a very narrow and deep gorge. This sight alone is worth the money! After around one kilometer, one will suddenly stand in front of El Khazneh, the Treasury, hidden in a small and deep hole-like valley. The ageless structure is carved out of a massive sandstone wall. A stunning sight indeed - there's nothing comparable. I thought that it would be a nice idea to hurry to the second main attraction of Petra, the monastery at the other end of Petra, to arrive there before all the other groups do. It took almost half an hour before I got there, but it was well worth the effort - I was the only one at the marvellous monastery, which is even bigger than El Khazneh. The hills and mountains offered a great view and are easy to climb. Only one hour later the place was full of people. I walked back slowly to have a look at all the other ruins. Petra is big and there's plenty to see. It's not just all the almost perfect halls carved in the rock, but also the multifarious sandstone with clearly differentiated colour layers extending from a bright blue to a pure red. The courtesy minibus left at 6 pm. All in all I walked through Petra for around 11 hours. I also climbed some of the mountains, and so I was pretty exhausted. My stomach reminded me that I hadn't eaten anything yet. 11 hours, and that wasn't even enough time. In the evening I watched an Indiana Jones movie with some other travellers in the community room. There's a scene involving El Khazneh, and so the movie is shown every evening. I'd seen the movie before, but watching it again after having seen Petra with my own eyes was something different. Early in the morning I took a bus to the capital of Jordan, Amman. The bus stops in front of the hotel, and so it's quite convenient. The trip takes around 3 hours and costs JD 2, unless the driver announces that he would throw out every foreigner somewhere in the desert if we wouldn't pay JD 3. I decided on option No 1 (by the way, locals pay JD 0.5). At the bus station of Amman, several taxi drivers approached the bus looking for prey. The bus station is far away from the centre, and so I shared a taxi (with a meter!) together with another traveller to Amman downtown for JD 1.2. Despite the bad reputation in the Lonely Planet, I tried the Cliff Hotel. It's a nice place. A bed in a dorm costs JD 3, a single room JD 5. The staff was extremely friendly and very funny. I spent the afternoon walking around Amman for some hours. The town has around 1.7 million inhabitants but it's a surprisingly boring place. There's an amphitheatre (actually nothing special), some mosques and a burstling downtown, but that's it. However, there were no annoying touts and merchants. Just say "No, thanks" and smile, and that's it. This is a huge difference to Cairo. I liked the Jordans and Palestinians - very nice and hospitable people who aren't importunate at all. There's no reason to stay another full day in Amman, and so I took of for a small excursion to Jerash in the north. This is a very well preserved, ancient Roman town (admission fee is JD 5). For me, it's probably the most interesting Roman town after Ephesos (Turkey) I have ever visited. After that, I took another minibus to get to Ajlun, an Islamic castle which had been built as a stronghold against the crusaders. The ruins of the impressive fortress are towering atop a mountain over a large valley. After several days in the desert, the green of the surroundings was almost dazzling. I went back to Amman on another bus. Public transport in the area is very good, and so it's no problem at all to visit both places within one day. The fare for the whole trip was around JD 1. I'd read about some bars in Amman downtown, and a refreshing beer was quite tempting. So I went to the Jordan Bar next to the Cliff Hotel. There, half a liter of draught beer costs JD 1.7, which is surprisingly expensive (because of the fact that Jordan is an islamic country and alcohol therefore isn't very popular). A few backpackers sat around a large table and invited me to join them. It was a funny group of individual travellers from five continents or so, but after a while it got even funnier. Suddenly some music from Boney M was playing, and some Jordanians started a polonaise without sparing the tables and chairs. What a surreal scene! This was going to be the funniest evening during this trip. I had much time in the morning to slowly proceed to Irbid in the north-west of Jordan. This place is mostly famous for its big university, but the town itself doesn't offer any specific attractions. I only wanted to see what life is about outside the dominating capitals and the tourist places. Additionally, it's a convenient base for getting to norhern Israel. Although not so interesting, it was fun to explore Irbid. Since I had plenty of time, I went to an internet café. More than one hour internet for less than half a dinar is not bad. I stayed in Al-Wahadat al-Arabiyya (no dormitory, single rooms cost JD 5). There was only one other guest - a German traveller. The first German I'd met during the last 10 days... The Egyptian owner of the hotel created a very nice place. There's even a so-called 'Bedouin room' and more. And he's a real joker. He sometimes offers a glas of tea, always for free, but sometimes he adds salt instead of sugar. Another favourite is to tell the ignorant guest that the showers would be right next to the mosque. "Grab ye towel and ask the Imam!". I suppose the main attraction of Irbid is this funny place. It was Friday again and I had another appointment with an Israeli I'd met in the internet. Friday = beginning of the Shabat. Which means that I had to be in Akko at the Mediterranean Sea before sundown. That was quite a challenge. The day before I'd found out that there's no more bus to the border. A taxi driver offered me to bring me there for JD 5. A fair price, but still too expensive. After a while I found a shared taxi, and after some haggling we agreed on JD 2. At the moment I wanted to get out, the driver suddenly changed his mind and said 'JD 3', but I convinced him that we had an agreement and he as a real man should keep agreements. The car didn't stop in front of the border crossing but only at a small road that leads to the checkpoint. And so I had to walk quite a while. The distance between the first checkpoint and the main checkpoint wasn't bad either. The Jordan-Israel border is marked by the tiny Jordan river. Time for 'Crossing Jordan!'. But it's not allowed - it's only 100 m from the Jordan side to the Israeli side, but everyone must take the shuttle bus (300 Fils). It's silly but there's no other choice. Again there was no other person at the checkpoint. I had no idea how to move on, and so I asked a border guard how to get to the next city. "Taxi" was the only answer, the fare would be NIS 35. Too much, and so there was only hitchhiking as the only alternative. That's what I thought when a car already stopped. Hey, telepathic hitchhiking! Great! The friendly driver took me straight to the bus station of Beit She'an. There I was looking for a bus to Haifa - quite a big city. But no bus. All I got was a bus to Afula. Halfway I had enough time to have a further look at my guidebook. According to the book, Beit She'an features a famous excavation site. Too late - what a pity. From Afula I took another bus to Haifa, where I could finally grab some lunch. Another bus took me to Akko north of Haifa, where I arrived in the late afternoon. I opted for Akko Gate Hostel in the old city centre (a bed in the dormitory costs NIS 25). It's a nice, quiet family-run place with a large terrace and a kitchen. I called my friend and so we could meet one hour later. She had a car, and so we went to Nahariya first before going to Rosh HaNikra at the Lebanese border. The place reminded me on the Berlin Wall. Some UN soldiers from Finland were crossing the border, but for travellers it's out of bounds. After visiting Rosh HaNikra we went back to Nahariya where we visited my friends mother. She was born in the Ukraine and so we could have a nice chat in Russian. My friend brought me back to the hotel and we decided to meet again the next day to drive around in northern Israel. After more than one hour of running around I could finally find an ATM which would accept my cashcard. Actually it's possible to use Cirrus/Maestro cashcards everywhere in Egypt, Jordan and Israel. There are many cash dispensers in Israel, but some do not work (or at least accept foreign cards) during Shabbat. I found out that the Hapoalim Banks are the most reliable. After that I took an extensive walk through the historic core of Akko. The town is already more than 4000 years old, occupies a small peninsula and is surrounded by an impressive town wall. During the crusades, the town was known as Acre. There's a well preserved crusader's fortress in the centre of town and a clever guidance system (which looks like a big cell phone - dial a number and you will hear the explanation) leads the visitor through the complex underground system of the fortress. The rest of the rather Arabic old town is very beautiful, too, if there wouldn't be countless busloads of tourists congesting the narrow streets. My friend already had the flu the day before, and it got worse. Which means that we couldn't meet again (thank you anyway, Maya!). Yes, it was Shabbat again so I couldn't leave the town. Shabbat No 3. The historic centre is nice but not very big, and so the afternoon was rather boring. To make things worse, I was the one and only guest in the hotel. But the view of the Bay of Haifa at night from the harbour in Akko was some kind of compensation. Early in the morning I took a bus to Haifa - one of the biggest cities of Israel. I had plenty of time, and so I walked to the Bab-Shrine, one of the two most important sacred places of the Baha'i faith. The Shrine itself is quite beautiful, but even more impressive are the surrounding Persion gardens. There are some food stalls inside the large bus terminal, and again I tried to order in Hebrew and English. The staff didn't speak English at all, and my Hebrew was limited to a few words. No problem - everyone was from Russia. Actually it seems to be easier to get by on Russian than on English. This comes at no surprise, since many hundred thousand Israelis come from the former Soviet Union. I went on to Jerusalem, of which I had very high expectations. That's why I wanted to stay in and around Jerusalem for the rest of my trip. It took less than 2 hours to get there, the fare was NIS 34. The bus terminal of Jerusalem is quite out of town. I took a bus to the Damascus gate and headed for Palm Hostel. This hostel seemed to be somewhat of a hot tip, because there were only very few guests. The dorm is great and even has its own shower and toilet. A bed in the dorm costs NIS 25, and there's a nice common room and a kitchen. For one shekel you can get a coffee or tea. Staff is very interesting and after two days I got quite familiar with them. I went out for a first walk through the partially roofed and very narrow old city centre in the evening. The dimension and atmosphere of the historic core as well as the huge city walls are indeed very impressive and beyond all my expectations. The day before I could only get a brief glimpse of the old town. This day should be fully dedicated to the historic centre. Before walking around a place, it's always a good idea to get an overall view from a high position first to understand the dimension. In Jerusalem this is best done from the tower of the Lutheran Church of the Redeemer. Admission fee is NIS 4 (reduced 2) and it's well worth the money. The Wailing Wall is a highly secured area, so it's like checking in at the airport. The atmosphere at the wall is somewhat special and hard to describe. The same can be said about the Temple Mount with the Dome of the Rock and the Al-Aqsa-Mosque (admission fee for the Temple Mount is NIS 30, reduced 22). The Dome of the Rock was smaller than I thought, but on the other hand its decoration is just marvellous and the Rock inside the Dome radiates a very special charme: For so many people it's the centre of the world! The Church of the Holy Sepulchre is permanently overrun. This is the place where Jesus Christ was crucified and buried, and so many thousand pilgrims visit the place every day. The church itself is quite overladen and chaotic. The famous Via Dolorosa isn't that long (this is not meant to be blasphemous) but also very impressive. The old town is divided into four quarters - an Armenian, a Christian, a Muslim and a Jewish quarter. All of them are worth a visit. The old city of Jerusalem is a microcosmos of monotheistic religions. There are countless churches of all major Christian sects, e.g. Catholics, Protestants, Armenian-Orthodox, Copts etc., synagogues, mosques and more. They concentrate within a tiny area and create a unique atmosphere. It appears to be a peaceful and harmonic place, but this is only the surface and some kind of a dream. As it had been proved countless times during the last years, the picture is illusive. Some people suggested that Jerusalem should become an international city which isn't owned by a country but by everyone. However this is mission impossible. Hundreds of rather secular souvenir shops disturb the sacred place, but as a matter of fact they simply belong to the narrow lanes of the old town. Most of the items are pure kitsch - among them plastic Jesus dolls (my favourite!). But it looks like many people would buy them. Haggling seems to be compulsory (as in the movie "Life of Brian" by Monty Python), but this is not the real deal: Even if you manage to beat down the price to 20%, you will still pay way too much. But who cares - the sellers are happy and so are the tourists. I saw tourists beaming with satisfaction when they left a shop with an oil lamp they'd bought for € 15 (originally € 50) - 'Made in Taiwan' was written on the bottom, and you can buy the same lamp everywhere for € 2 or so. Needless to say that t-shirts are bestsellers as well. Among them two shirts which startled me. One shows a combat aircraft and the Israeli flag with "Don't worry America, Israel stands behind you" written below it, another one shows a person roared with laughing and the quote "Peace in the Middle East!?". The next stop was at a spa at the Dead Sea. It's true - you can swim whilst reading the newspaper! Unfortunately all newspapers were written in Hebrew. The buoyancy is so strong that it's hard to dive. It's a bad idea to get water in the eyes or to enter the lake with a scratch or something. The water feels like soapsuds and tastes... well, it's better not to try it. It's quite important to take a fresh water shower after the bath, so better look for a place with appropriate amenities. It was really hot and the sun was burning mercilessly, so it was good not to stay longer than one hour. And so we headed northwards to Ein Gedi, an oasis at the Dead Sea. This must be the garden of Eden! A green valley full of vegetation gathering around water falls and an appropriate wildlife amidst the desert. I couldn't believe my own eyes. A place to spend several weeks. But we only had one hour time, which was definitely not enough. Admission fee to Ein Gedi is NIS 20. After a quick photo stop at Qumran we went further to the north to Jericho, allegedly the oldest (some 10,000 years) but definitely the deepest town (290 m below sea level) on earth. But there's not much left of the glorious past. Climbing mountains early in the morning makes hungry. Eventually we stopped at a restaurant in Jericho at about lunchtime. Coincidentally, the owner of the restaurant was the bus driver's brother. It's way too expensive, so some travellers including me went for the restaurant next door. We slowly went back to Jerusalem but not without stopping at St. George's Monastery and the marvellous Judean Desert. The desert offers a great vista of completely vegetation-less mountains and deep canyons. Back in Jerusalem, we had a last stop at the famous Mount of Olives, from where one can see the entire old town. I'd rarely seen so many coaches in one place! Hordes of tourists flocked together. Our tour finished at 3 pm. It was slightly exhausting but definitely recommendable. From the bus stop near Damascus Gate I took a minibus to Hebron (NIS 5.5) in the southern part of the Westbank. Staff at the hostel as well as the guidebook said "Try to look like a tourist" - no problem! Hebron is infamous for permanent clashes between the Arab majority and a small Jewish community. It's all about the Ibrahim Mosque / Machpelah cave, which is a sacred place for both Jews and Muslims. The atmosphere is very tense indeed. There's a lot of military in town, and countless barriers, large fences and several watchtowers divide the streets in the centre of town. Accordingly, there are no tourists in town. However the huge Arab bazaar is highly interesting, but the heavily secured Ibrahim Mosque isn't. Some columns inside were still riddled with bullet holes, remainings of a massacre among Muslim prayers in 1994. Before entering the place, all luggage needs to be x-rayed and there's a short grilling about the reason for the visit. From Hebron I moved back towards Jerusalem with a stopover in Bethlehem halfway. Many visitors flocked around and the whole place was very touristy. The huge Church of the Nativity containing the cave where Jesus was born is worth a visit even for Atheists, but the kitsch Milk Grotto Chapel and Rachel's Tomb aren't. This day was supposed to be the last day of this trip. It was clouded (and I haven't seen clouds for weeks) and it had got remarkably colder. I took a bus to Yad Vashem in the suburbs of Jerusalem. This Holocaust memorial and museum is very depressing. Especially the 'Monument of Deportation' was moving. Well, I'm German although I don't really care about nationalities. I don't feel responsible for what had happened, but I feel responsible that something terrible like this shall never happen again. Next stop Mea She'arim - the living quarter of ultra-orthodox Jews. Some people say that they throw stones when a car tries to enter the district at Shabbat. I'd read that this part looks like an East European 'Shtetl' (former Jewish ghetto in almost every East European town, but all of them had been destroyed), which was the reason for me to go to Mea She'arim. Countless banners and posters reminded the visitor to dress 'modestly' and not to run around in large groups. They are right - may the visitor share their views or not, no one deserves to feel like living in a zoo. I wasn't in a group and I was dressed modestly, but I decided that it's better not to run around in the smaller lanes of the quarter. In the evening I packed my bags and noticed that my flight ticket was gone. Why? And where? I didn't check my flight ticket everyday, so I wasn't sure since when it was gone. One thing was for sure - it was inside a small bag. The bag was still there, so it must have been stolen. That's bad, because I was supposed to leave at night. I tried to call the airline, but it was already 9 pm so no one answered. 'Maybe they let me fly even without the piece of paper' I hoped and took off. In the evening there's no direct bus from Jerusalem to the airport (which is between Jerusalem and Tel Aviv), and so I had to go to Tel Aviv first and then to the airport. The flight was scheduled for 5:30 a.m., the airline's office opens three hours before the flight. So I had to wait until 2:30. Staff told me that it would be impossible to fly this night. Yes, they can issue a replacement, but therefore they would need the data of the flight ticket. They reserved a seat for the flight next night and asked me to contact my ticket broker. Day 23 (unintentionally) What to do next? I took the first bus to Tel Aviv, leaving around 5 am in the morning, and went to the Gordon Hostel again. I purchased the flight ticket via the internet, but I don't buy my tickets from the same company all the time. Unfortunately I couldn't remember the name of the broker I'd used this time, I could only vaguely remember their logo. I gave up at around 7 am and slept for two hours (not too bad!). And I tried again. Somehow I managed to find it after a while and I went to another hotel to phone the broker. The broker told me that he would try his best to transmit the missing data, but he couldn't guarantee since it was already Friday noon. All I could do was going to the airport again at night in hopes of receiving the data until then. If the data would not have arrived, I would be in deep trouble. Why? Well, it's Friday night, and this means it's Shabbat and there wouldn't be another bus! To make things worse, the following days are 'Rosh Ha Shanah', the Jewish New Year. Guess what, no public transport! I learned my lesson well - always make a copy of your flight ticket before you leave (a suggestion to other travellers: scan your ticket before you leave and upload it somewhere, so that you can print it out everywhere!!!). For the rest of the day I zigzagged through Tel Aviv. I also went to the police to report the theft of the flight ticket. After that, I returned to Gordon Hostel, although I didn't have a room. The last shuttle bus to the airport was about to leave at 7 pm. I went to the bus station at 6:30 pm. And waited. 6:50. 7:00. 7:15. 8:00. No bus. There was a phone number of the bus company written at the bus stop. So I called the number. The operator told me that she would try to call the bus driver. I called again. Now, the operator told me that the bus driver must have switched off his cell phone, because it's Shabbat. Gawd! I hate Shabbat! A taxi was way too expensive for me and I had much time. So I started to walk - from the centre of town somewhere eastwards, because the aiport is a few kilometers east of Tel Aviv. I had neither a map nor the slightest clue how to get there. After more than two hours of quick walking (my luggage was around 15 kilogramm) I'd reached a huge crossing in the suburbs. There I tried to hitchhike. After a few minutes, a friendly Russian stopped and gave me a lift to the airport. I was completely exhausted when I arrived there after 10 pm. The office wouldn't open before 2:30, but coincidentally I met the friendly office lady from KLM. She remembered me (did I appear to be so desperate!?) and checked the computer immediately. Yes, the data had arrived, although the reservation for the connection flight from Amsterdam to Berlin was unsure. At that moment, I didn't care at all about the connection flight. But: Due to the fact that I'd lost my flight ticket, I would have to pay a fine - USD 75. The document issued by the police was of no help. No problem, I thought - there are some ATM's in the airport so I could withdraw some money. And so I unrolled my sleeping bag and tried to sleep for three hours. Day 24 (really the last!) I woke up at 2 a.m. and went to the ATM. Unbelievable! Both ATM's (there are only two) didn't accept my Cirrus/Maestro cards (usually they do), because it's Shabbat. I went back to the counter and asked if it would be possible to pay the fine in Amsterdam. The answer was clear - no money, no ticket. USD 75 - that's NIS 305. I'd got NIS 175 left and an emergency reserve of USD 35 (which I usually spend in duty free shops for souvenirs etc). I went to an exchange booth and got NIS 130. That was close! And so they finally issued my replacement ticket. Ben Gurion airport is infamous for its fierce luggage examination and border control. Probably not at night - after 10 minutes everything was done. The next two hours I spent waiting in the lobby without a single shekel, watching all the other people buying ridiculously cheap whisky and other stuff in the duty free shops. There were more ATM's in the lobby, but they didn't except foreign cashcards either. We took off on time but for some reason I couldn't sleep. At 9 a.m. we landed in Amsterdam. I'd never been to Amsterdam and had around six hours time, and so I went for a walk through the city. The plane to Berlin at 3 p.m. was booked out and I hadn't got a reservation, but some passengers didn't show up so I could board the plane. It was already 8 p.m. when I arrived in my appartment - almost unable to walk. Except for the last two days a very rewarding trip. At the same day I'd left the country, full-scale riots broke out in Gaza, the Westbank, Jerusalem and other places. A disco opposite Gordon Hostel was blown up, leaving many young people dead. Some buses in Jerusalem were overrun by suicide squads. I was shocked - before my trip through the Middle East, Israel was a place far away from my own country. Now I watch the news closer, as if a part of me would still be there.